All in all I was pretty satisfied with how my winter cross-country season went having seen a progression in performance from 10th at the Yorkshires, thru 8th at the Northerns, 28th at the National to 38th at the Inter-counties, and finishing 2nd Yorkshire counter. However, throughout this time I never felt happy running, my body felt awkward and like I was not really using my left leg… not very helpful when you’re trying to run!! I have actually had this feeling for several years but each time I set myself a target event I’d think “maybe it’ll be better this time” but it never was. I would usually make it to my target event but either end up competing injured or promptly get injured immediately after it and my body just wouldn’t let me get beyond this point! It was a physically and mentally draining circle and one that I had really had enough of. I wasn’t willing to force myself to run when it was becoming more of a chore than a pleasure and it was with that attitude that I started to work more frequently with Fit-for-Purpose. I would certainly set them a challenge alright…I had a body that wasn’t necessarily injured but was certainly not right and limiting not only my performance but my enjoyment of running and a mind that had well and truly had enough! I felt that to get back on track I needed to get my body sorted and my head would follow, but John and Christine were keen to use a double pronged attack and try and re-address both at the same time. It started with a video analysis of me running on the treadmill in the clinic and this was certainly revealing. I clearly did different things with each leg and from this together with general movement analysis potential areas of tightness were identified and Christine got to work on massaging and stretching these. There was almost an immediate difference, I was able to stride out and didn’t feel as twisted…things were looking up! After working with Fit-for-Purpose on these specific issues things have come on leaps and bounds…I feel like I have two functioning legs for the first time in ages and it is now a pleasure to hit the roads and trails every day. 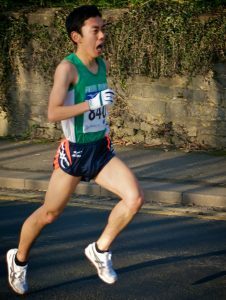 I was training really hard for the British Universities Cross Country Championships but developed a slight pain in my shins due to overtraining so my physical condition was far from my best. A day before the race, Christine gave me a massage, which removed the pain in my shins as well as easing tension in my legs and feet. Thanks to her massage, I was perfectly prepared for the race and felt very confident while competing the race.